I’ve got my patio finally sorted out. I straightened things up. Moved things around. Took things to the dumpster. Cleaned the cement with my hose. It took me a bit of moving around to get things where I liked them. One change that is really positive is the moving of my bird bath. It is now where I can see it from where I sit on the couch looking out toward the patio. Now I keep my camera with the zoom lens on it next to the couch so I can grab it when I see a bird at the bird bath. Before this, I’ve been missing out on getting bird photos. Because if I see a bird and get my camera and start to go out the patio door, Abi starts a crazed barking fit. Not sure why. And the birds are scared away before I can even get out there. Much less get a photo. I moved the sewing machine tables. And moved all the plant containers, including the galvanized gardens, closer to the seating section. I did this so that my plants can get more sun. The over hanging trees were giving them too much shade. Those galvanized containers were difficult to move. I did it about an inch at a time because they are so heavy. At one point the one on top fell, and I had a heck of a time getting it back up there. I walked around the patio and took photos at different angles so you could see the whole thing. And here is my view from inside seated on the couch. 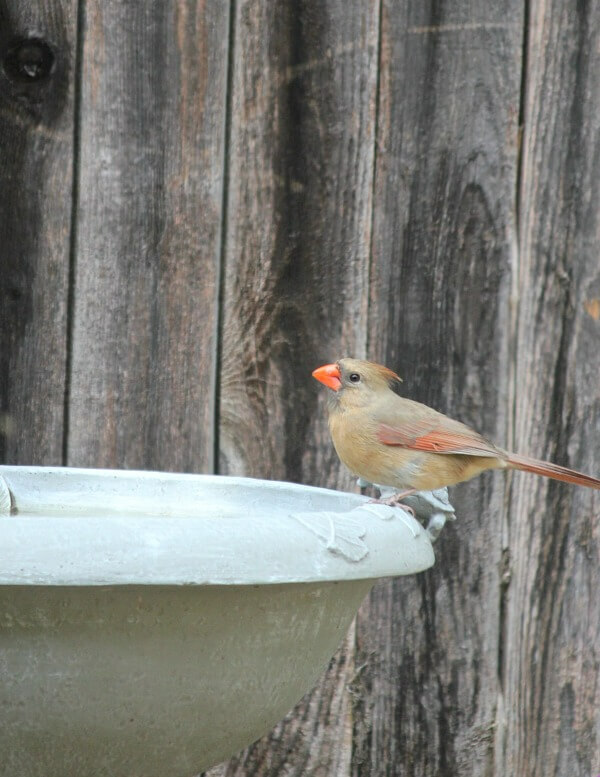 I’m really enjoying seeing the birds at the bird bath. Now all is cleaned up on the patio. And I can relax knowing a job is done. Yes, I sure can. It is so nice out there right now. Not very hot yet. Actually a bit cool, strangely enough. 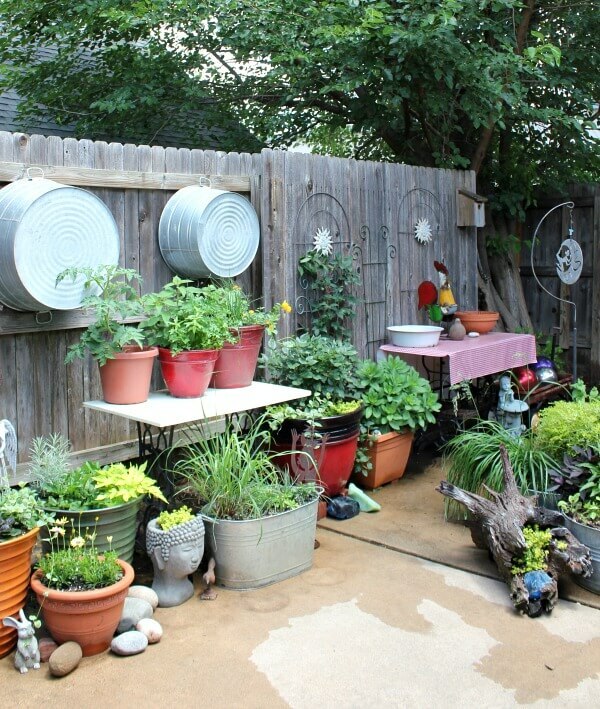 The patio garden looks marvelous, Brenda! And it looked pretty darned great before you moved things. I love the amount of enclosed space you have. 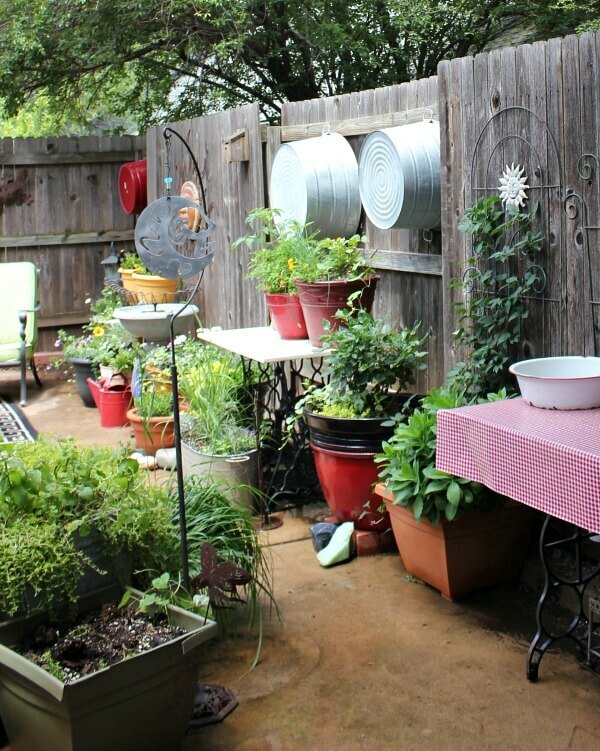 It seems two or three times the size of most garden apartment patios, which gives you plenty of room for gardening but not too big of a space to keep up. It has privacy, some sun and some shade. But the main factor is you and your gardening and design skills. You've made it a delightful place. Moving the birdbath was a great idea. By the way, have you ever had a hummingbird feeder? We just got one for our yard but we probably aren't getting it hung up in time. Thanks for the wonderful photos that show how your hard work pays off. I'm afraid to put out any kind of feeder for fear I'll end up with mice again. With restaurants across the alley from me with lots of dumpsters close to my fence, I just can't feed the birds any more. You did a great job Brenda, the patio looks nice. At least hard work tends to pay off. I'd had the bird bath in that same spot for a year. But I really didn't get to enjoy watching the birds. Now I can. Looks serene and beautiful. What a lovely space. It is serene. I go out there, find myself humming along as I work. It all looks great. You still have my favorite wagon of balls. There's really not another good place to put those gazing balls except in that wagon. I use that wagon when I'm hauling heavier stuff down to the dumpster, so it's very handy to have! You have a really charming outdoor living room! I'm warming up to the look without the gazebo. Mine is two pieces as well. I took the top off, then "walked" the bird bath base over to where I wanted it. Didn't lift it. I do the same. Try to get things done in the morning. Yes, I used to move around like crazy. Now, not so much! Looks great, Brenda!! Is it getting hot there yet? I'm sure you'll miss having the shade of your gazebo to sit under, that's too bad. Not really. Last night I had to turn the heat on. Abi had had her teeth cleaned, three teeth removed, and a place taken off her head that was stitched yesterday, and she kept coughing. So I turned it on in the wee hours for her. 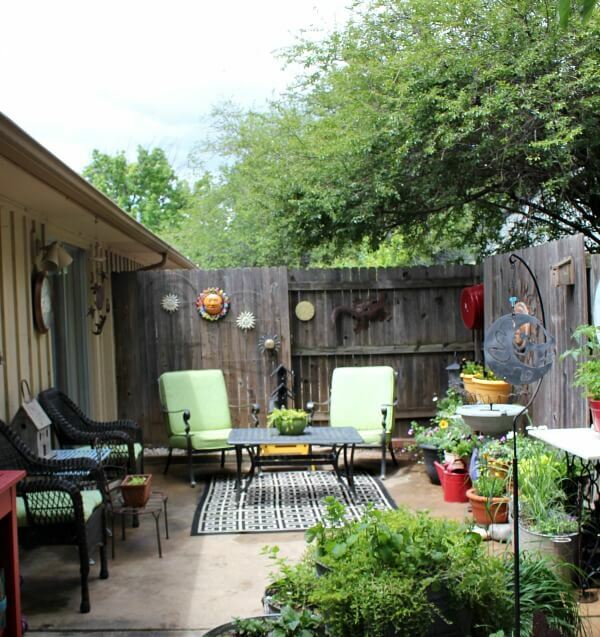 Love your patio area…your plants are so lush and pretty. Till the high temps get them, they look lush. Your plants look fantastic! 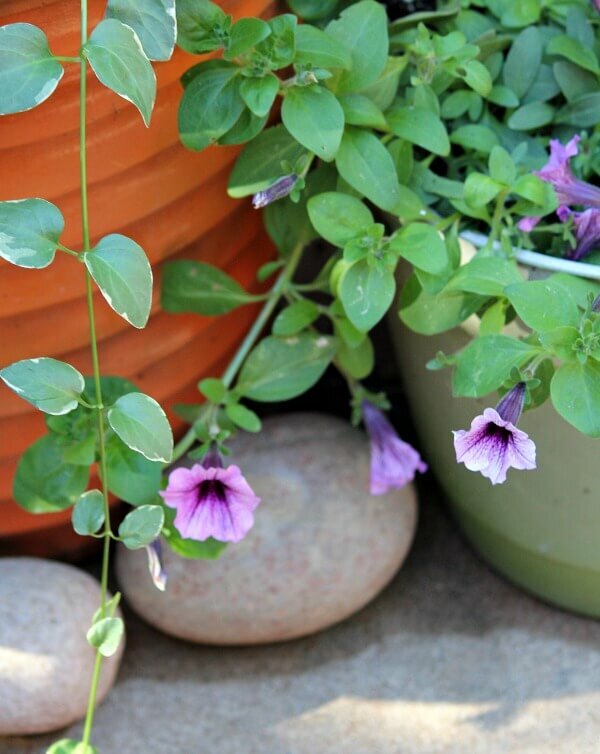 They have grown so fast; you surely have a green thumb and know what you are doing out on your patio. Beautiful photos! You learn as you go. And I've been gardening a long time. I so enjoy following your blog. 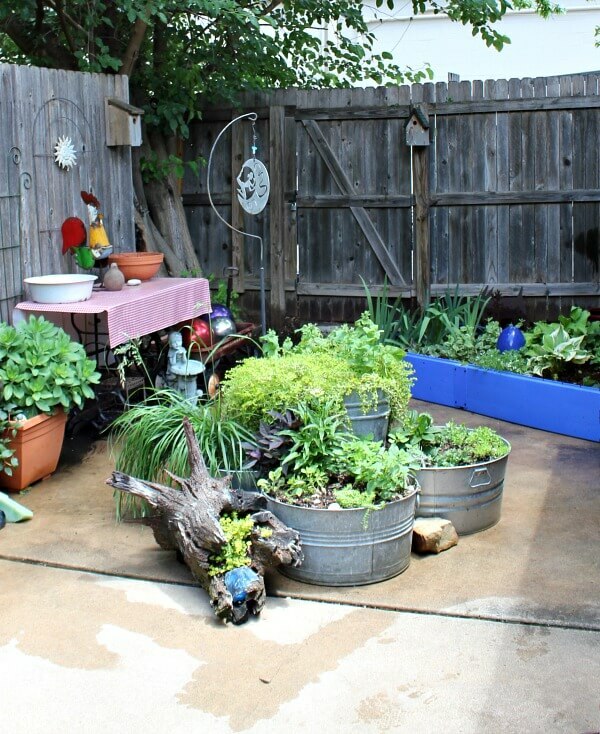 I am so to be a retired teacher and I am taking many ideas from your patio garden. I live in a condo in NC and have a balcony, so I have just started to grow plants and flowers. I am looking forward to getting more inspiration from you. I love apartment living, since it's one story and I have that huge patio. I'm on the end of the four plex, so very private and quiet. Love your patio Brenda, it looks great and so inviting. 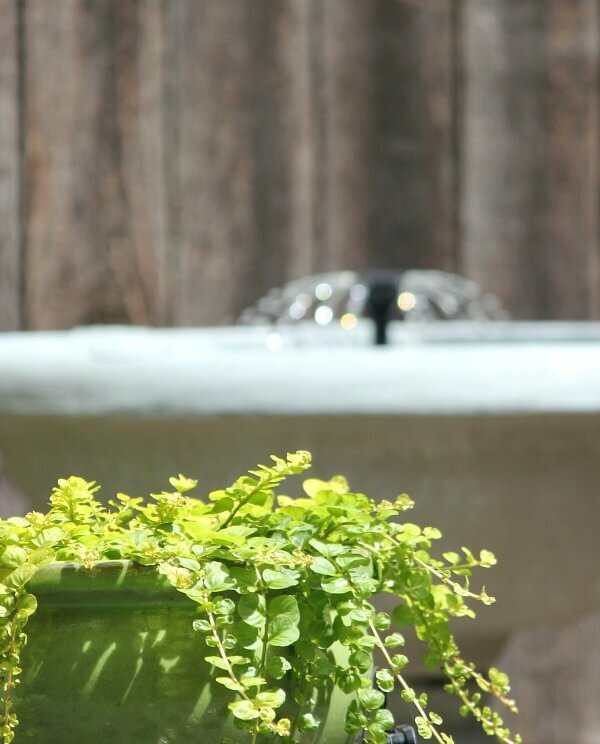 I am hoping to get a bird bath for my patio when we move in July but I wanted to keep the water moving so it doesn't attract mosquitoes I found a great product at Amazon It is a bird bath solar fountain, and it is reasonably priced at around $17.00. Are the Pupsters happy with the new placement of the pots? I hope Abi is recovering nicely after her trip to the vet. This bird bath is solar powered, so the fountain runs when the sun is out. So fun to have a bird bath. Enjoy! I've ordered a small table top bird bath from Wayfair. You could do that on your balcony. Yes, it is solar powered. The exercise will be good for you, and the end result even better. 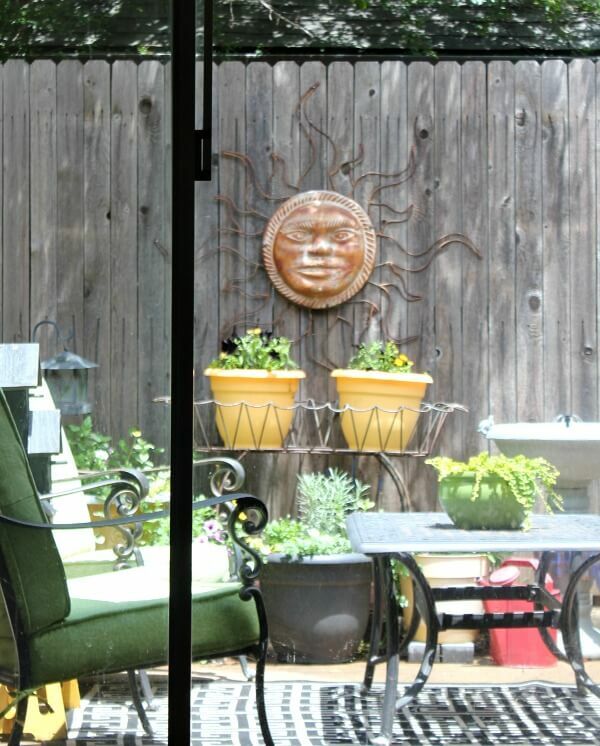 I love all the photos of your patio and it looks wonderful with out the gazebo also. I love a bird bath and need one that I can see out my window. I love watching the birds at my feeders, they are so pretty. Good job. I can move things, just might take me a bit longer then before. This bird bath is solar powered, so I don't use electricity. Good for you! your garden area looks so pretty and things are so lush and green. Didn't you use to have a canopy? 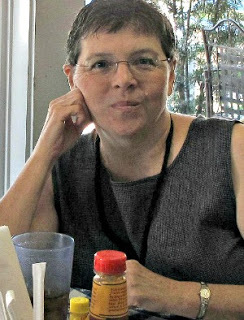 Oh, Brenda, may I come and sit on your patio? It looks so pretty. I love the little bunny by the pot under the hanging wash tubs. I can just imagine trying to move those galvanized gardens. I'm surprised you didn't throw your back out! Here's a suggestion I read somewhere not too long ago regarding planting large containers like the wash tubs: before putting in the soil fill the pot one third to one half full of styrofoam peanuts or those little styrofoam beebees—can't think of what they are called–you usually mix them in the soil to lighten it. Anyway, I tho't that was a good idea because either of those materials would allow the soil to drain. I wish I'd known about doing that before I shoveled a whole bag of soil into the big pot I have on my front stoop! I won't dig out the soil this Spring before planting but maybe next Spring if I want to move it. I, too,enjoy watching the birds come to feed on my deck. My dining area table is right in front of the patio door so I can eat breakfast and see them all come to chow down. I have a bird bath, too, but it's not visible from that patio window. I forget to put water in it, too, as it isn't right under my nose! Maybe I'll move it. Change things up a little around here! Thanks for your "show and tell!" I do put light materials in the bottoms of big pots so they aren't as heavy. Brenda, it's so pretty out there! I love it. It was cool all week, now it's hot. Still a pretty sight to me due to all the birds and such though. So pretty, I bet your space smells good, too. I want a birdbath, just looking for the perfect one. This one is nice, as it's powered by solar.